Dr. Vishal Chugh is a board certified, qualified dermatologist and is a Gold Medalist in both MBBS & MD. After completing his post graduation from Government Medical College,Surat, Dr. Vishal went on to secure fellowship in Dermatosurgery from the prestigious Bangalore Medical College & Research Centre, Bengaluru. His stint in Bangalore lead him to train with “Cutis Academy Of Cutaneous Sciences” where he had extensively trained himself in the field of Dermatology and Cosmetology. 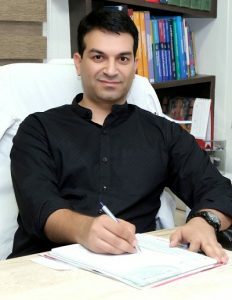 He also holds the rare distinction of being awarded both a national , IADVL Fellowship (AIIMS, Delhi) & international, ISD Fellowship (Tehran, IRAN) where he worked with Prof. Yahya Dowlati & trained himself in Hair Transplantation & Cosmetic Surgeries. Besides these accolades, he has been going for various training programmes world wide to stay updated with all latest technologies & innovations to satisfy his quest for the best in aesthetic science. Awarded ISD Mentorship in Dermatosurgery and Paediatric Dermatology at Tehran. Gold Medal in OBS & GYN for securing highest marks in university in MBBS.